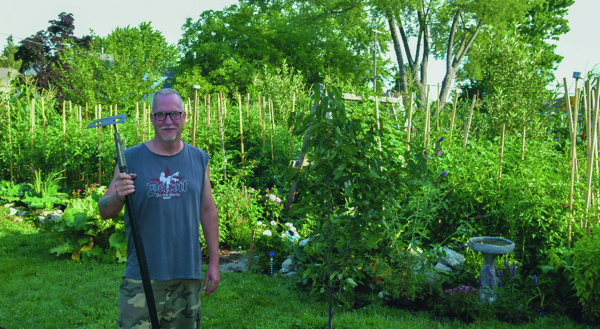 At some point this summer, you may have seen Bernie Laframboise’s garden. It would have been hard to miss, and impossible to forget. 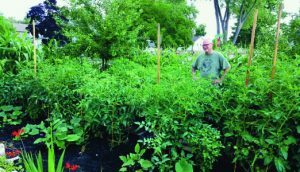 His corner lot was lined with giant corn plants, with a dense forest of vegetable plants hiding behind them. 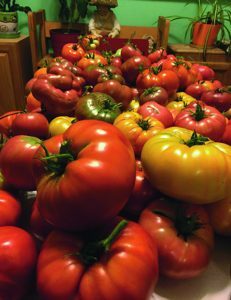 Bernie has over 30 tomato plants in 15 different varieties, with some seeds coming from as far as China and Russia. The tomato plants are staked and trained to grow upwards, all reaching over six-feet-tall. The uglier the tomato, the more delicious it is, and his heirlooms are a point of pride. A handful of tomatoes have weighed up to two pounds. In addition to the impressive quantity of quality corn and tomatoes, Bernie grows squash, zucchini, rhubarb, pumpkins, green onions, jalapenos, pimentos, bell peppers, asparagus, grape leaves, okra, potatoes, beets, pole beans, carrots, sweet potatoes, lettuce, chilies, kale, and cucumbers, just to name a few. He has a handful of fruit trees, including pears and apples, as well as melon and berry plants throughout his garden. There is also a wide variety of spices and herbs. Bernie places plants strategically,like encouraging companion growing by mixing basil plants in between his tomatoes. The entire yard is also lined in beautiful flowers and hanging baskets that attract bees and butterflies. Bernie offers gardening tips, such as using 100 per cent organic materials in your garden for a higher quality produce. Cow manure and fish emulsion help to enrich soil. Pruning leaves off of tomato plants help direct the growing energy to the tomatoes themselves. Collecting rain water is very useful – Bernie’s 250-gallon tank helped him make it through the heat spell this summer. Above all, Bernie says you need dedication. “Be prepared to be married to the garden,” he explains.Bernie works full-time as a developmental mechanic. 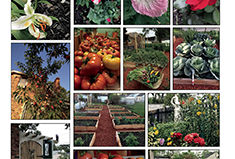 He also provides Ferndale Friends with some of the beautiful photography you see in each issue. His garden is his third job. He uses his vacation time to plant and prepare every spring, using PVC hoops and plastic sheeting to make greenhouses on his raised beds. Every night after work as well as throughout the weekends, Bernie can be found in his garden, digging, weeding, and picking. The reward certainly outweighs the amount of work. Not only does Bernie have more produce than he can eat, he has a backyard oasis. The height and density of his garden makes for the perfect amount of privacy. He has a small cabana in the midst of the gardens, perfect for him and his friends and his dogs to relax. Although Bernie has only lived in his house for three years, his efforts look like they have taken a lifetime. The importance of growing natural healthy food is a message Bernie wants to share with the world. Watching your efforts grow from seed to food is a process that not many people get to partake in, but it is a very important one. Canning and preserving food is how people have made it through difficult times, and is an important part of surviving. 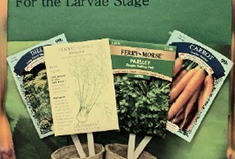 In addition to the health benefits that fresh produce offers the body, there is a therapeutic aspect to gardening. “It is good for the mind to keep the body busy,” Bernie explains. “You forget the world exists when you’re making your own world in the garden.” It doesn’t take a lot of land to grow your own food, just a lot of love and dedication.